Graduation in 2019 runs from Monday 16 to Saturday 21 September. 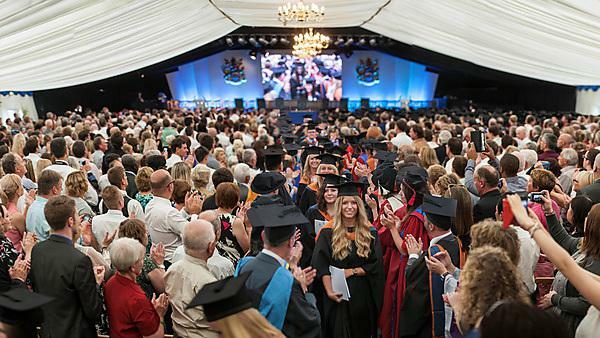 Download the graduation ceremony timetable for September 2019. What do I need to know about attending my ceremony? If you successfully complete your studies before the start of graduation week 2019 you will be eligible to attend the ceremonies. If you successfully complete resit examinations in September 2019 you will also be able to attend these ceremonies. When will I be able to book my tickets? Booking will open on Thursday 1 August for ceremonies taking place on 16, 17 and 18 September 2019. Booking will open on Friday 2 August for ceremonies taking place on 19, 20, and 21 September 2019. If you are unsure when your faculty award boards meet and do not know whether you will be eligible to attend the September 2019 ceremonies, please contact your​ Faculty Office for advice.